Solid, durable, natural, warm and beautiful are just a few words about granite countertops that describe its uniqueness. Granite is an igneous rock that is formed under the earth’s surface from its magma, which is composed of a variety of minerals such as: quartz, feldspar, and mica. Granite got its name from the Latin word “granum”, which means grain. This is because it is a coarse-grained mineral and is classified as such by mineralogists. Granite gains its own unique and distinct texture from this grainy feature. Granite is available in a variety of colors that include black, red and yellow depending on where it was formed. There are also different types of finishes that help to create unique slabs of granite that are ideal for distinctive and unique countertop surfaces. Granite, like most other natural stones (e.g. marble, limestone, etc. ), is hundreds and thousands of years old. When learning about granite countertops, you should know that just about all natural stones possess a porous surface. This means, if they aren’t sealed properly, they can be penetrated by liquids such as water and oil. Granite is the second hardest natural stone when it is compared to the diamond. It is more than strong enough for everyday use which is just one of the reasons it is an optimal material for countertops. Granite comes from far below the earth’s surface and forms during a process that can take upwards of thousands of years. Over a long period of time, liquid magma is forced back and forth between different layers of rock. When it finally cools, it forms a solid layer of granite rock. Granite acquires its signature crystalline appearance from the trace mineral elements that are still attached to the surface after its cooling process. It is during this process that granite becomes an extremely hard and durable stone, making it perfect for countertops and vanities. Learning about granite countertops is a long process. It helps to discover where granite gets its features to better understand and appreciate its beauty. Granite’s features depend on where in the world that particular portion of rock was formed. Although granite is distributed vastly throughout the world, it is generally manufactured in countries such as Africa, Spain, India, Brazil, China and Norway where there are high volumes of the stone. Amazingly, knowledgeable experts are able to determine specifically where a particular piece of granite came from based solely on its color alone. Generally speaking, red and black granite is found in Egypt or a desert within the United States. White granite with gray specks is generally from China and finally, blue granite is generally from the coast of Africa. Granite’s overall color is influenced,mainly, by the minerals that are fused inside each slab. For example, quartz adds a soft white color, while feldspar will add a blue or a green tint to the granite. Can you tell me something about granite quarries? When learning about granite countertops, you should learn their origins once the rock itself is formed. Granite is usually always mined in quarries, which are basically large pits or, in other words, excavation sites. The direction in which the granite rock will break is the easiest way to determine how a quarry will be set up and organized in order to obtain the largest possible amount of granite. At most quarries throughout the world, diamonds are used in order to cut the granite. This is done because diamonds arethe only stone harder enough to cut the granite. The final step in the quarrying of granite is cutting it into useable sizes. This is usually accomplished by using wire saws. If the granite is going to be used for countertops and bathroom vanities, it is measured, cut and polished into manageable shapes and sizes. What are the different types of granite finishes? 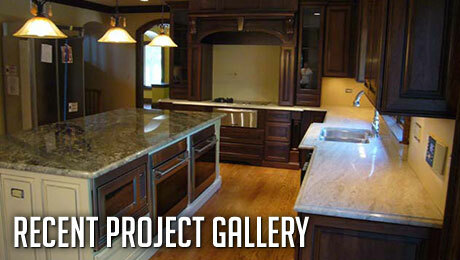 There is a large variety of ways to go about granite countertops production. Granite surfaces are finished in many ways. They can be polished, honed, flamed or brushed; each technique will add its own unique look and texture to the stone. A polished finish is definitely the most common because of a few key factors involved. Polished finishes will help to give your home a distinct and elegant look. This type of finish is a great choice, especially for kitchens. A polished finish is easier to maintain than most other finishes and its sparkling appearance brings out the all of the color in your granite. Granite’s polished finish can often be described as both shiny and mirror-like. Honed finishes are slowly becoming more and more popular for newly installed granite countertops. This type of finish is smooth and also less shiny than the polished finishes. Its less shimmering appearance gives your home a slightly more causal and contemporary feel while still maintaining the elegant feel granite is known for providing. A drawback of honed finishes is they are, unfortunately, known to show more stains when compared to other finishes. Don’t let this deter you from this choice however; as long as you make any effort to clean, maintain and care for your countertops, they will be just fine. There are also certain sealers and various types of treatments that will help keep your beautiful honed countertops stain free. Just like all other granite countertops and finishes, honed countertops are extremely durable and,if taken care of, will last a lifetime. Another way to go about granite countertops production is to give them a flamed finish. What are the pros and cons about granite countertops? The choosing of a material for your kitchen countertops or bathroom vanities should be done with extreme caution since these surfaces can drastically shape the look and feel of a room. Remember that these surfaces must also endure a large amount of everyday wear and tear. Like other types of countertop materials, granite has pros and cons that must be weighed. There are several features that are unique to granite that help contribute to its recent rise in popularity. What is the best way to go about granite countertops maintenance? 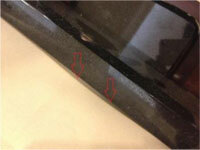 Once granite is originally sealed, it is quite easy to maintain. The first sealing of granite is one of the most important because granite is naturally porous and will stain very easily without it. After you seal your countertop, your granite is protected and is now ready for use. Remember that it is imperative that you reseal your granite counters at minimum once per year. This can be done either on your own or can be done by a professional. Either way it will help to ensure that your granite countertops remain stain free. If there is a spill, make sure to clean it up before the stain gets a chance to seep into the surface. Because of its porous nature, granite is somewhat absorbent and even when sealed can still absorb stains if spills are left untouched for any extended period of time. Generally, you are able to clean your granite countertop using just a soft clean cloth alongside a neutral cleaner. You should definitely consider the use of a disinfectant type cleaner that is specially designed for granite. The use of regular cleaning products on your countertop should absolutely be avoided at all costs. These chemicals will take the seal right off and leave behind it the vulnerable and porous surface of the natural granite stone unprotected and exposed.We encourage you to call your stone dealer with any questions or about countertop maintenance, care or even cleaning. How long can I expect my granite countertops to last? There’s something you should know about granite countertops. When they enter your home, they are already hundreds or thousands of years old. The best part about granite is that it will most likely last another thousand years. Granite is an extremely impressive stone. Granite is tough, stain and scratch resistant and can handle some serious heat. Granite can withstand temperatures up to 900 degrees Fahrenheit (482.22 degrees Celsius) without causing damage. Experts will tell you that cutting on your counters won’t hurt the countertops at all, it will only dull your knives. Short of trying to cut your granite with a diamond or, more dramatically, smashing it with a sledge hammer, it will not break or even crack. These statements are just some of the evidence available that will prove that you’re granite countertops can last a lifetime. Can granite countertops add value to my home? We know about granite countertops, and let us tell you that countertops made of natural stone, especially those made of granite, add a great amount of resale value to your current home, more so than any other available material. We can also tell you that granite countertops can last you a lifetime. This means, after the costs involved with the initial installation, along with with proper maintenance and care, your granite countertops will never have to be replaced. If your heart is set on granite countertops, but you still have some concerns involving the cost,we can offer you several recommendations that will help to lower the expense. One way to decrease granite costs is to be selective on where the granite is imported from. For example, there are experts who say that purchasing granite that is imported from Italy will tend to be one of the most expensive options. On the other hand purchasing granite that is imported from China is less expensive and will ultimately save you money. Cost is one thing about granite countertops that can still be a problem for some consumers. If granite countertops continue to escape your price range, there is always hope for the future. For example, it is often seen with a variety of products, as their popularity rises and the quantity and demand of the product increases, the price tends to lower. In addition to this, new quarries are being discovered each and every year. The increase in product choices and quantity of raw materials help keep prices down. It can be discerned that granite is a perfect countertop material because of its unrivaled durability, but lets not forget about its spectacular aesthetic appeal. Granite is very versatile when it comes to visual appearance. It can offer an elegant and luxurious look, or a casual and contemporary appearance, depending on your choice of color and finish. The best part about the appearance of granite countertops is the simple fact that its luster will never fade or dull over time. One of the things that we know about granite countertops is that there are seemingly endless color options for granite. Each individual piece of granite is one of a kind; no two pieces will ever be identical. Colors range from greens, to blues, blacks, pinks, whites and even yellows, like we said, the options are endless. Granite slabs also vary greatly in patterns, there are some that have very large, intricate designs and movements while there are others that are much more subtle. We have taken the liberty of listing all of the colors for granite countertops that we know about. Granite countertops colors and their basic characteristics are described in the list below. Brown /Beige – These are very neutral tones and will easily compliment the other colors in your kitchen and/or bathroom. Brown and Beige tend to be the most popular color choices because they are not only complimentary colors but also provide a more comfortable and traditional look. Yellow / Gold– Yellow and Gold countertops have the ability to brighten up any room. Yellow and Gold countertops also add a warm appearance along with a rich and luxurious style. Red – Red granite has the ability to create both a striking and a romantic feel. Reds are also know to draw people into the room and they will absolutely spice up the style of your home. Black– Black provides an extremely modern, clean and sleek appearance. Black granite countertops can either be plain by nature or can also incorporate very interesting patterns as well as additional colors. Blue and Green– Blue and Green tones tend to be very vibrant and very lively. Bright greens and striking blues have the ability to give any room a rare and exotic feeling. These colors are generally found inside other color counters from whites to reds and even blacks. White– White countertops have the ability to give a room a more soothing feel or a more modern and elegant feel dependingon how the rest of the room is decorated. White generally matches with all other colors and will give smaller rooms a more spacious appearance. Tell me about granite countertops installation. Granite countertops should absolutely be installed by a certified professional to ensure that they are installed properly. Even though hiring a professional to install your granite countertops will add to the total cost of the project, in the long run, it is definitely worth it to have it done correctly. The incorrect installation of granite countertops can easily lead to very serious and expensive problems. What are the variations in thickness between granite slabs? Between different granite materials? Granite is available in a wide variety of thicknesses. The most popular thickness is a 3 cm, or 1-1/4”, thickness but it is also available in a 2 cm, or 3/4” thickness. The weight of a slab varies, of course, in relation to its thickness. The weight of a granite slab is generally 12-13 lbs per sqft in a 2 cm thickness and 18-19 lbs per sqft in a 3 cm thickness.For example, an 8-foot countertop slab that is 3 cm thick will weigh somewhere between 144-152 lbs. The granite thicknesses can vary as much as +/- 3 mm throughout the slab. Due to the fact that granite tends to not be a uniform thickness throughout the whole slab, installers will compensate for the width variations with added support. What recommendation for customers that if have uneven walls that creates gap behind back splash? We recommend calking and painting to same color of the wall to achieve the finished result. What happened when shut off valve under sinks doesn’t shut off completely? 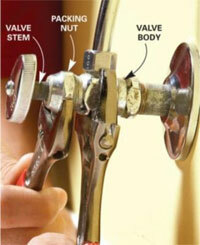 Using valve cap, bucket to contain water and or faucet hose to drain pipe and call plumbing to have it repair. How can I fix gap by backsplash (tile) that caused by temperature change in Midwest area? Using flexible calking in a tube instead of using grout. It will allow the joint be moreflexible. 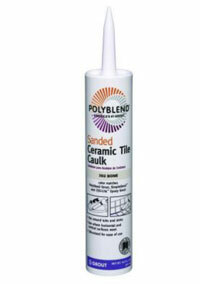 Custom Building Products Polyblend #382 Bone Sanded Ceramic Tile Caulk. When you’re ready to buy granite countertops, get in touch with us today by calling (773) 373-3323 or click here to reach us onlineCM Stone Works Inc.. Our help staff can help you get exactly what you want from your new kitchen counters so that you’re able to personalize your kitchen and turn it into something that’s truly yours. With our service, you can have your new countertops installed and turning heads in 1 week – GUARANTEED! 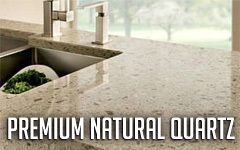 We offer brand name, high quality kitchen countertops at affordable prices. Get in touch with us today and find out for yourself! Marble is usually not the best choice for a kitchen countertop. Although it can be sealed, it is not as dense as concrete or granite and therefore it is more porous and susceptible to being stained in a highly used area like a kitchen. It is much softer and it will chip and crack under frequent use. Just like granite, marble is sealed after the fabrication process. Marble can be used for a number of various applications like fireplace surrounds, tabletops, saddles, and shelves. Ideally it can be applied to a number of projects in the bath area like Jacuzzi surrounds, vanities, floor, and shower paneling. Generally you can safely use marble in low-traffic areas. Should I use marble or granite for my kitchen countertops? Although typical application of marble is for the bathroom vanities, Jacuzzi® tub surrounds and fireplaces, it is sometimes used in kitchens. Marble is not used as often in kitchen environments like concrete and granite simply due to the fact that it is easy to scratch and is affected by acidic substances, such as vinegars, ketchups, etc. Moreover the high-gloss of the marble countertop can be partially lost as many chemicals etch its surface. Granite in turn is considered the second hardest stone, its polish is not subject to etching by household acids, or scratching by knives and pots and pans under normal use. Since mineral surfaces are quite porous they absorb liquids, which may result in discoloring and staining. Although there are many commercial grade products available on the market which may bring the stone to its to its original luster, taking simple precautions and regular maintenance can save a lot of trouble and cost. All marble and granite tops are sealed immediately after they are installed. With course of time, depending on how heavily the tops are used, the sealer gets washed out. The clear indication of this happening would be the fact that the liquids are easily absorbed into the stone leaving temporary (if promptly wiped off) stains. You should seal your marble every six months and your granite every year. The old rule of thumb is never to use anything you wouldn’t use on your hands. DO NOT use powdered cleansers or abrasive pads to clean your stone. Even “soft scrub” type cleaners contain pumice, which is a powdered volcanic stone, and might damage your stone countertops or floors. Never use any product which is acidic; this includes substances like ammonia or many common liquid cleaners such as Windex®. You should always use sealers and cleaning products designed specifically for natural stone. When you’re ready to buy granite countertops, get in touch with us today by calling (773) 373-3323 or click here to reach us online CM Stone Works Inc.. Our help staff can help you get exactly what you want from your new kitchen counters so that you’re able to personalize your kitchen and turn it into something that’s truly yours. 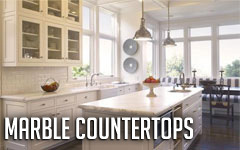 With our service, you can have your new countertops installed and turning heads in 1 week – GUARANTEED! We offer brand name, high quality kitchen countertops at affordable prices. Get in touch with us today and find out for yourself! HanStone™ is a stone surface made from pure, natural quartz. HanStone™ offers the natural beauty of quartz with up to six times the strength and durability of granite. Approximately 93 percent of HanStone™ is mined quartz crystals, one of nature’s hardest materials. The quartz is combined with high-quality polyester resins and pigment to produce a natural stone without the high-maintenance. What are the advantages of HanStone? A high-performing surface, HanStone™ is nonporous preventing unwelcome germs, bacteria and mildew. It does not require sealing, conditioning and polishing. HanStone™ is also scratch and stain resistant unlike alternative surface options such as granite, tile and marble. How many color surfaces does HanStone™ have available? HanStone™ offers design flexibility to make any vision a reality. Available in more than 32 colors and patterns in North America and more than 50 globally, , the colors of HanStone™ are inspired by the hues and textures in natural stone, delivering one of the strongest and most durable surface materials on the market, without sacrificing style. How do I care for HanStone? Simply clean up any spills with soap and water. For routine cleaning, use a small amount of cleaner that is non-bleach and nonabrasive along with warm water and a damp cloth. Repeat as needed to keep the lustrous gloss and radiant sheen. Although HanStone™ is resistant to stains, any type of spill should be cleaned as soon as possible. Any liquid spills, fruits, vegetables, or other foods should be wiped up and cleaned with soap and water. Please refer to the HanStone™ Care & Maintenance Guide. HanStone™ is intrinsically a nonporous material preventing unwelcome germs, bacteria and mildew. It does not require sealing, conditioning and polishing. Because HanStone™ contains approximately 93% quartz, the hardest components of natural granite, the surface is highly scratch and impact resistant. However, as with any surface, sudden impact, excessive force/pressure, or misuse can damage the stone surface. Do I need to finish or seal HanStone? No. Unlike natural stone products, HanStone™ is a non-porous surface you will NEVER have to apply a sealer to our surface. Can you cut directly on the surface of HanStone? It is a matter of choice. While HanStone™ is made of more than 93% natural quartz crystals that are up to six times harder than granite, it is always recommended to use a cutting board to prevent any dulling of the surface that can occur over a long term of surface cutting. When preparing meals, can raw foods be placed directly on the surface? Yes. HanStone™ is a non-porous surface. This means germs and bacteria can not accumulate with regular cleaning. HanStone™ is an approved surface for commercial food preparation areas in restaurants. Can hot plates and pans be placed directly on HanStone? While HanStone™ can withstand heat, it is still advised to use hot pads or trivets when using cooking units such as electric frying pans, crock-pots, roaster ovens or in place of hot pans directly onto the surface to avoid potentially damaging temperatures. Prolonged exposure to heat will damage HanStone, and such damage is not covered by warranty. HanStone™ is made from pure, natural quartz. Variation in quartz, color, shape, shade, pattern and size are unique traits of HanStone™. Although some HanStone™ colors may be more consistent than granite, color variance is an inherent trait expected of HanStone. In addition, small blotches or random distribution of particulates are an inherent part of overall design and composition and are not considered to be defects or product non-conformity. The 10-Year Limited Warranty does not cover color variance, and HanStone™ application will not be replaced for these unique, inherent traits of HanStone. If I remodel my kitchen countertop with HanStone, will it be seamless? HanStone™ is not a seamless product; seams are generally visible. Inspection for color coordination across seams and multiple pieces is strongly recommended. Use a damp, soft cloth with warm water and soap. If needed, apply common, non-abrasive, household cleaners such as Soft Scrub Liquid Gel with Bleach, or Comet Soft Cleanser Cream directly on a damp cloth or sponge and wipe the surface, rinsing thoroughly after cleaning. To avoid dulling the surface’s shine, make sure to use a non-abrasive cleaner, and rinse off any cleaner with water. To remove adhered material such as food, gum, or nail polish, first scrape away the excess material with a plastic putty knife and then clean the surface with a damp cloth to remove any marks left behind and any residual dirt. Caesarstone is resistant to cracks, scratches and stains. However, like most materials, excessive force and/or pressure from objects can damage the surface.Caesarstone is resistant to most stains caused by fruit juices, liquid food coloring, coffee, tea, wine, grapes and soft drinks.Caesarstone’s non-porous nature provides maximum resistance to staining and fully eliminates the need for any sealing. The non-porous quality of the surface also greatly reduces the potential for bacterial growth. Do I need to apply a sealer to Caesarstone? No. Caesarstone is a non-porous surface, so you will never have to apply sealer to any Caesarstone surface. Can I cut on my Caesarstone countertop? Caesarstone surfaces are highly scratch resistant; however, avoid using sharp objects such as sharp knives or screwdrivers directly on the surface. The use of a cutting board is always recommended. How do I maintain Caesarstone's natural beauty? Polished: Due to its high density and non-porous qualities, normal cleaning with a damp cloth and mild detergent will keep your Caesarstone surface looking like the first day it was installed. To avoid dulling the surface’s shine, make sure to use a non-abrasive cleaner, and thoroughly rinse off with water after use. We recommend a thorough cleaning of your Caesarstone surface on a regular basis (because of the patina that can develop on the surface from day from cooking, grease oils in the air) to keep the surface as beautiful as the day it was installed. Honed: Please understand that HONED, TEXTURED and MOTIVO finishes will require more daily maintenance than our polished finishes. Since there is more exposed surface area with honed finishes, metal marks, finger prints and other signs of daily living will show on honed material. Most of these marks can be easily removed with little effort and non-abrasive cleaning products such as Soft Scrub Liquid Gel. How does Caesarstone withstand heat? Caesarstone is structurally more heat resistant in comparison to other stones, including granite. However, any stone material can potentially be damaged by sudden and rapid temperature changes, especially near the edges. Therefore, using inexpensive and readily available hot pads or trivets is always recommended, especially when using cooking units such as electric frying pans, crock pots, or roaster ovens. We do not advise putting hot cookware directly on the Caesarstone surface. We recommend using cleaning products between pH 5-8, as products outside this range may damage the surface. Avoid exposing Caesarstone to chemicals with pH levels outside this range, such as oven grill cleaners, floor strippers, toilet bowl cleaners, oil soaps, tarnish removers, furniture cleaners, drain products, etc. Should your surface accidentally be exposed to any potentially damaging products, rinse immediately with water to neutralize the effect. Is caring for my Caesarstone surface really this easy? Caesarstone’s care-free maintenance and everlasting benefits and performance allows more time for the things that matter most to you. Whether you selected Caesarstone to be your surface of choice for food preparation or to simply beautify your home, you can enjoy the peace of mind knowing that Caesarstone is completely worry and care-free. Can Caesarstone be used outdoors? While some customers have opted to install Caesarstone in outdoor applications – this use is not covered by our Lifetime Warranty. Caesarstone has not been tested in prolonged UV ray exposure settings.